According to the National Highway Traffic Safety Administration, 1 in 4 car crashes are side impact crashes. As a Mom, this statistic is frightening to me since I drive my precious cargo exposed to side impact danger in an older model vehicle without side impact airbags. Thankfully I discovered a car seat that offers side impact crash protection: the Britax Frontier 85 Side Impact Cushion Technology (SICT) car seat. The Britax Frontier SICT technology works by transferring energy from a car crash to something other than your child. 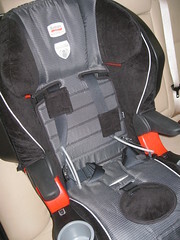 In my opinion, this side impact cushion technology is easily the best feature of the Britax Frontier 85 car seat. A Seat that grows with my kids: The Britax Frontier 85 SICT seat will be the last car seat I will need to own since it offers simple size adjustments and a booster seat conversion. Specifically, the seat adjusts to a range of 2 years and older, weights from 25 pounds to 120 pounds, and heights from 30 inches to 65 inches. The seat converts to a booster for kids over 40 pounds and 42 inches. 5-Point Safety Harness: The Britax Frontier 85 SICT offers a safe and tangle free 5-point safety harness that can be used for kids weighing up to 85 pounds, or up to 120 pounds in booster mode. I especially love that this safety harness has several adjustment options; up to 20” vertically and 3 buckle positions allowing me to adjust the straps to a safe and comfortable position for my child. Removable and washable booster seat cover: We’re a road trip loving family. Therefore, ketchup stains and sticky soda spots are bound to occur on the road. I love that I can easily remove the Britax Frontier 85 booster seat cover and throw it in the wash after each road trip. Heavy: The Britax Frontier 85 SICT seat is heavy weighing 22 pounds. If you do plan on transferring this seat between cars or through an airport on a regular basis, this seat is a heavy option. However, I did appreciate that the seat felt substantial; equating to a safer seat in my mind. 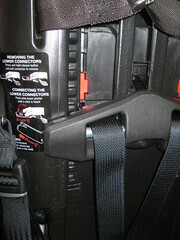 Front pad slippage: The buckle on the harness comes with an insulated cover for comfort that is attached to the buckle by a thin piece of elastic and it easily slips off. It will only be a matter of time before the front pad is lost in my car’s back seat black hole of lost French fries and library books. Price: Yes, it’s an expensive seat retailing at $340. However, I can’t put a price on the peace of mind that I receive knowing that my precious cargo gains side impact protection from this seat. Britax can be proud to claim a line of defense during a side impact car crash with the Frontier 85’s side impact cushion technology. This side impact cushion technology is peace of mind for me. The Britax Frontier 85 seat is substantial, safe and fully adjustable for growing kids. Disclosure: I received a complimentary Britax Frontier 85 SICT car seat to complete this review but all opinions are my own.